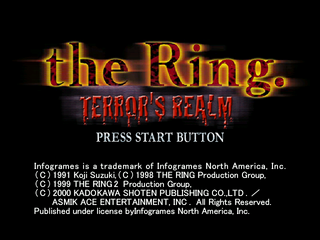 The Ring: Terror's Realm, called just Ring (リング) in Japan, is a survival horror game for the Sega Dreamcast. It is based upon the Japanese horror novel Ring and its 1998 film adaptation. Main article: The Ring: Terror's Realm/Magazine articles.